Jumping Through Hoops When the Morning Comes~ | personal.amy-wong.com - A Blog by Amy Wong. 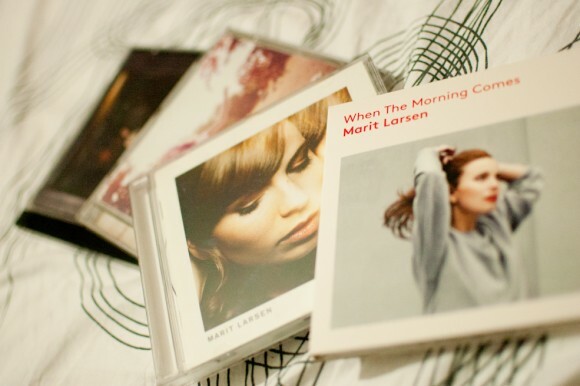 OH, man~ the things one has to do to get Marit Larsen albums. Spark wasn’t that hard, since it somehow made its way to Amazon, but it seemed so unlikely that When the Morning Comes would show up there again, so I went hunting. It was not a fruitful web-hunt with everyone telling me they did not do international shipping. Marit’s 4th album has finally joined its siblings. It also means Marit’s the only 2014 album I had actively physically purchased so far, beating my 2013 record when I only got BiBi’s Unlock as a present (more yay friends!). However, I did just recently physically purchased Calle 13’s Multiviral considering it was my album of 2014. I’m surprised myself. I’m a little sad that most (if not all) my purchases are digital.